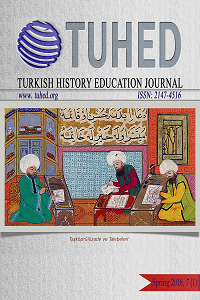 TUHED invites all scholarly work contribute in history didactic, history teaching and historiography written either in Turkish or English. Manuscripts written in Turkish must contain English title, abstract, keywords and also 700-1000 words Extended Summary in English. Please organize your research and theoretical articles in accordance with the TUHED Manuscript Template. TUHED uses Publication Manual of the American Psychological Association, 6th edition, 2009 as a citation and referencing guide. Please see APA 6th edition for more information. The submission has not been previously published in any other journal, nor submitted to another journal for publication consideration. The submission is original and written by stated author(s). The submission is written either in Turkish or English. Manuscript written in English has to have max. 250 words abstract followed by 5-7 keywords. The submission written in English should not exceed 6.000 words (including title, abstract and bibliography). The submission file is in MS Word (.doc or .docx) format. The text adheres to the stylistic and bibliographic requirements outlined in Information for Authors, which is found in Journal Submissions. Spell and grammar checks have been performed. Authors' names, institutions and address information should be excluded in the submission text. 1- According to the TUHED's new publication policy, the articles which have completed the evaluation process will be published on the basis of the date on which they were accepted for publication without waiting planned publication date.